This is what we discovered after analyzing recent automation workflows sent through Omnisend. In fact, what we found was eye-opening. Seeing that, we decided to show you how your business can take advantage of Omnisend’s order confirmation emails. Let’s take a look at why order confirmation emails are so beneficial and why you can’t afford to overlook it. This kind of high performance comes from the fact that order confirmation emails enable you to reach a more receptive audience—new customers. In essence, order confirmation emails act as a receipt for a successful purchase. When someone places an order, there is a general expectation to verify the transaction by taking action. In other words, the customer is more willing to engage with the email by reading or clicking the content. Secondly, order confirmation emails mark an important milestone in your customer journey. The focus is now shifting from acquiring a customer to retaining one. This transition means that your business has earned enough trust for someone to buy from your store. Eventually, the transaction indicates that the customer no longer has any objections to buying from you and is more familiar with your brand. Lastly, order receipts act as an autonomous sales channel on its own. To a large extent, the ability to sell through email depends on how many subscribers are on your list. But when someone buys from your business, the condition of being a subscriber is no longer valid. Therefore, order confirmation emails allow your business to sell more. Now that you know that how important order confirmations are in your email marketing strategy, let’s look at the three reasons why order confirmation emails are performing so well. 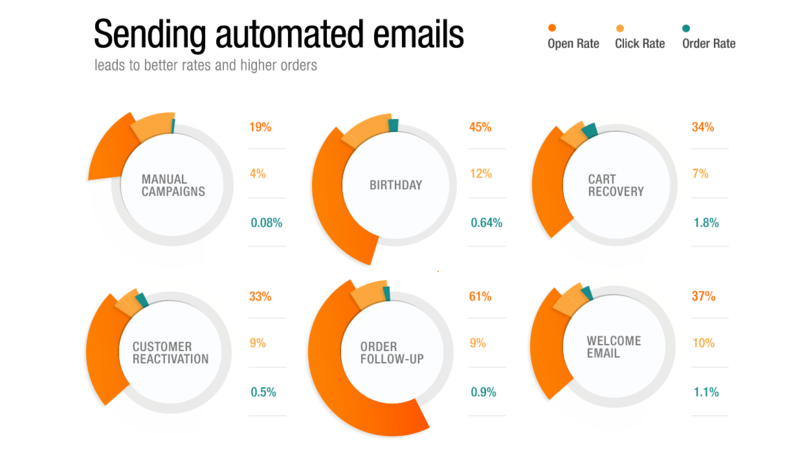 Did you know that 64% of customers consider order confirmations to be the most valuable type of emails? From a buyer’s perspective, the value is perceived in the form of getting satisfaction after making a purchase. The shopping experience provides us with instant gratification and customers expect to know if their intentions were successfully met. This explains why order confirmations have such a high open rate. Customers are not only more receptive to order confirmation emails, but they also tend to check them repeatedly. Customers are often interested in double-checking their purchases. They want to verify whether the address was entered correctly, when the order is expected to arrive or how much the item was charged. All these concerns from the buyer side result in higher email open and click rates. There is a measurable difference between being forgotten and being remembered. According to Brain Rules, visualized information is memorized 6 times better than the same information in text. That’s why it’s hard to expect that the default, text-based Shopify order receipts will generate engagement. 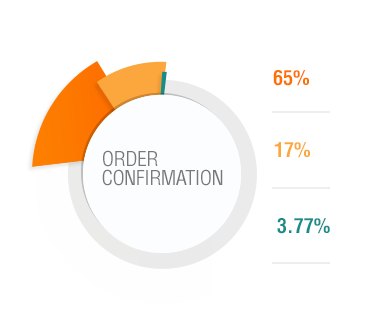 Order confirmations that are more visual in nature, on the other hand, provide two benefits. They improve your brand recognition and consistency, since recipients can easily identify your brand and quickly scan purchase-related information. Consequently, branded order confirmations tend stick in the memory for a longer time of period. In practice this means that customers are using order receipts as a reference point for future email engagement. 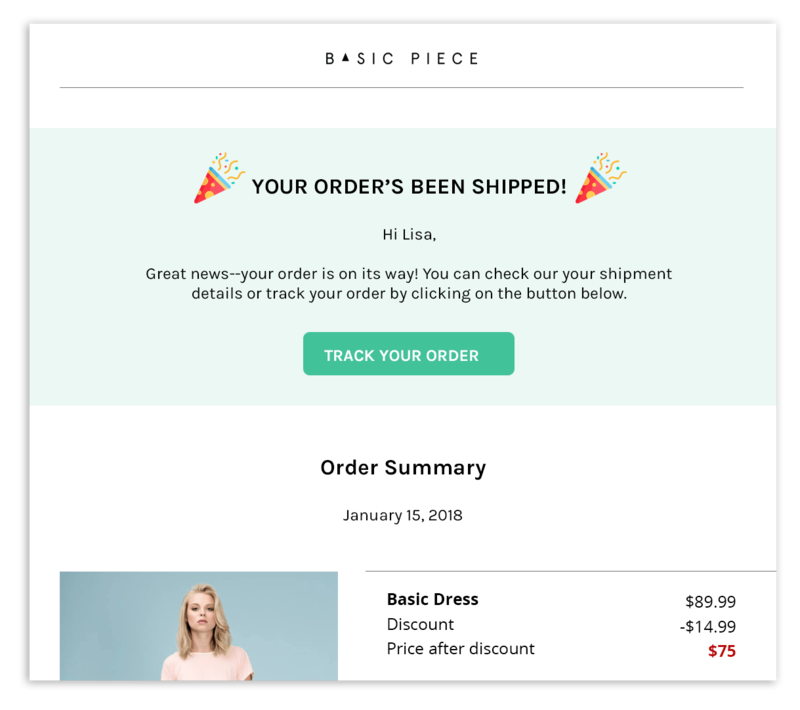 For the last (and probably most anticipated) part of this order confirmation email guide, we’ll look at how you can increase your engagement and sales. Order confirmation emails provide a marketing opportunity to target your new or existing customers while their engagement levels are at the highest point. Below, I’ll share a few common examples our Standard and Pro users have had great success with. Purchase related information should still be the central focus of the email. Make sure the order details are the first things your customers see. Don‘t forget to replace the default order confirmation content in Shopify with a simple ‘thank you‘ note. Otherwise, your customers will get two confirmation emails at once. You can find instructions on how fix it in our Knowledge Base. To make things easier on your side, Omnisend provides you with an order confirmation template so you can get started in minutes. As mentioned before, keep the transaction-related information on the top. Then, add additional content blocks to the bottom, depending on your business goals. Capitalize on the opportunity to address any customer concerns. If your store is regularly getting repeated questions regarding their purchase, a dedicated FAQ section would solve the problem of answering the same requests over and over again. Also consider providing quick access to other communication channels like a phone number or chat. Your customers will appreciate the convenience of getting support more quickly. By far, this is the most frequently applied tactic by Omnisend users who want to generate additional sales. Remember that order confirmation emails are read attentively and repeatedly. Use that opportunity to incentivize your customers to buy in the near feature. There are a couple of actionable options to up-sell or cross-sell with your order confirmation emails. If your business is selling rapid consumption or frequently re-purchased goods, consider offering an incentive order again. When the product is about to be consumed, your customers will remember that there’s a great discount in the previous order confirmation email. In case your customers are interested in recent or trendy items (such as movies or clothing), encourage future sales by recommending your newest products with a discount or a special offer. In a similar fashion, you can showcase your top selling or complementary products depending on the industry you’re in. As your customers are more apt to take action, why not to take the opportunity to educate or promote your content? If your customers are satisfied with their purchase, they will be more likely to see value in your videos or blog posts. The same logic applies to your social media contests. 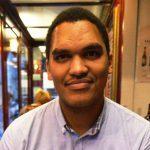 We’ve just covered the strategies that are are bringing the best results for our users. However, if you’d like even more ideas, please check out our dedicated blog post. I hope you learned something valuable and got a few great ideas for how you can apply it to your business. You’re now fully prepared to get the most value out of your order confirmation emails. If you’re already using Omnisend, simply click here to enable the Order Confirmation workflow. If you’re not using Omnisend yet, get more information about our order confirmation here. Or get started today by signing up. With shipping confirmation (a new automation workflow in Omnisend), you can delight your customers by letting them know when their order has been shipped. This one is pretty easy to set up–all you need to do is set the Trigger to Shipping Confirmation. This is initiated when the fulfillment status is changed to fulfilled. Technically, you can also set a delay between the time the order is fulfilled and when the email is sent to your customer, though we can see no really good reason to do so. 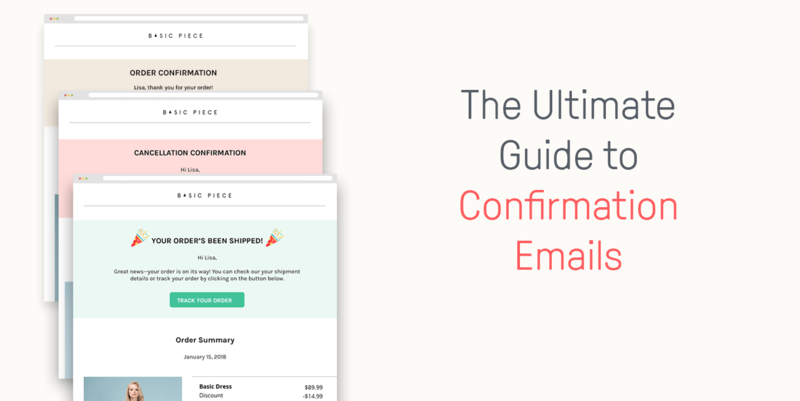 Let’s look at how shipping confirmation emails can help you increase your sales on autopilot. Here, you should emphasize the fact that their order has been shipped and is on its way. You shouldn’t downplay this, but make it a moment of elation and delight for your customers. When you include your personalized branding in your shipping confirmation emails, you will make sure that you stick in your customers’ minds. That way, whenever they need the type of products you sell (dresses, shoes, gadgets and more), they’ll be sure to think of you first. Another way you can use your shipping confirmation emails is to make sure that your customers buy from you again. Don’t just use it to notify your customers that their order has been shipped. Of course, this should be the most emphasized information (give your customers what they want, after all), but it shouldn’t be the only information. 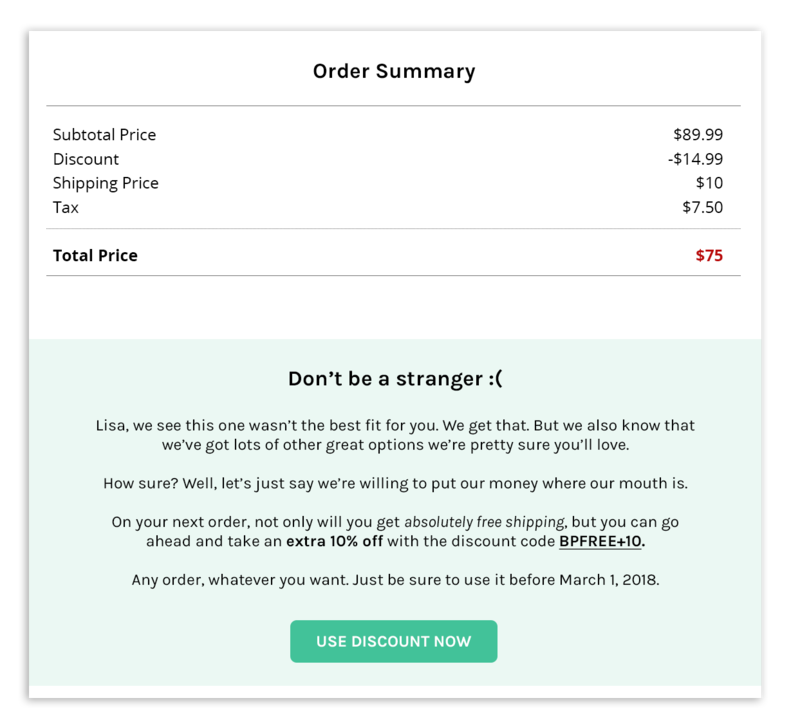 Add a unique discount code so that they know they can use it to buy from you again. They may not use it immediately (especially seeing as they haven’t yet seen the product). But if they like what they bought from you, and they see that they can get the next item with free shipping or 10% off—they’ll be much more motivated to buy again. All they’ll need to do is come back to the shipping confirmation email to use it. Cancelations are no fun. That’s definitely true, not just for merchants but also for the customers. After all, they’ll have to go through the entire process of canceling the order, and then you’ll have to refund them. However, it doesn’t have to be a completely negative experience. In fact, there are ways you can turn this into a money-making opportunity for your online store. Let’s look at some of the best ways to do that. When you edit the styles, remember that this doesn’t mean your customer is completely done with your company. It could be that they ordered the wrong style, color or size, or are no longer interested in that particular product. You can maintain your positivity and brand by continuing to provide quality throughout all your communications. Remember, take the opportunity to build up your brand in all situations. You’re investing in long-term customers this way. They may not have wanted or liked this particular product, but you should take this opportunity to show off some of your best stuff. You can do this with automated Product Recommendations, similar to what we offer in our platform. With this, you can set up automatic product recommendations either based on your top sellers or your newest offerings. This means you can excite them about what else you have. Of course, everyone loves an incentive, so you can also include a reason for them to come back to more. 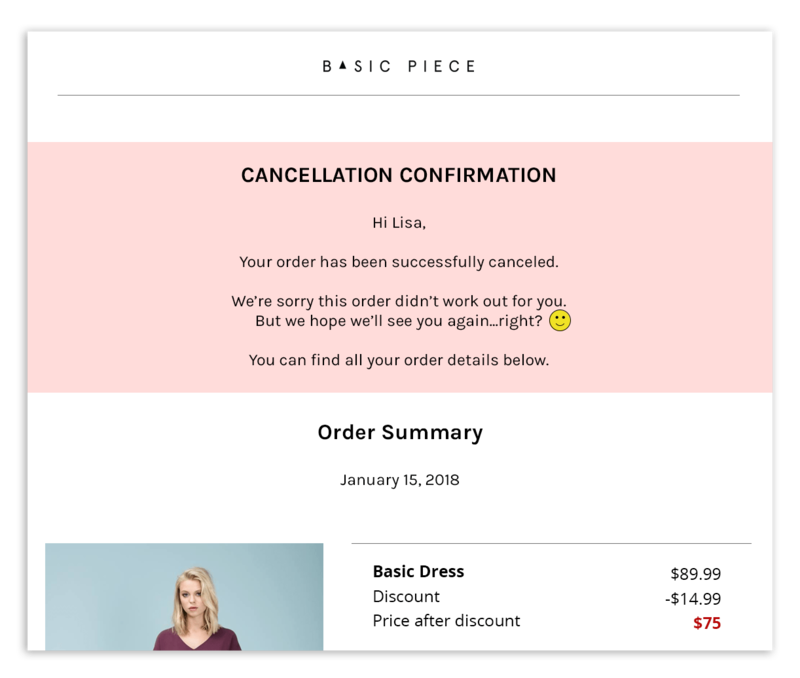 There are lots more ways you can motivate your customers to buy more in your cancelation confirmation emails. 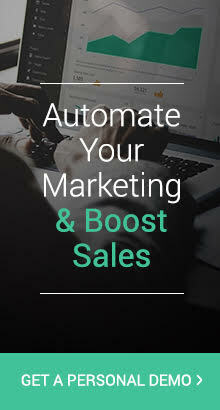 In the next section, we’ll show the most profitable combinations of confirmation emails to really boost your sales on autopilot. 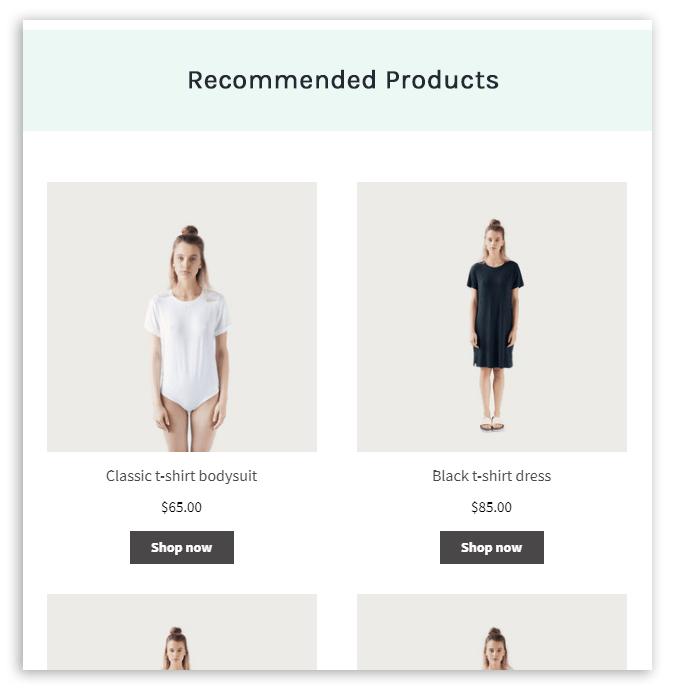 Combined with order confirmation emails, the shipping confirmation emails and cancellation confirmation emails will help you boost your sales by increasing your customer’s lifetime value.